It accounts for approximately 6% of all ED visits (1), but the pathology behind each presentation varies greatly. Studies suggest that the majority of these patients have a non-cardiac cause for their chest pain. However, approximately 15-20% are ultimately diagnosed with ACS (2), which is a diagnosis we certainly do not want to miss. The American College of Cardiology and the American Heart Association provide recommendations for the evaluation of chest pain patients, which may include serial troponin, a stress test, or some other form of cardiac imaging (3). Of the 8-10 million patients that present to the ED each year with chest pain (4), many have only a few risk factors for acute MI and may be receiving costly testing that isn’t indicated. Previously, it was difficult to identify patients in the Emergency Department setting who could be classified as low risk and appropriate for early discharge. Subsequently, the HEART score was developed in 2007 and is a tool that allows Emergency Physicians (EPs) to do just that. This can result in reduced medical consumption and cost savings without sacrificing patient safety. So, what do we do with this information? The HEART Pathway, validated in a study by Mahler et al., represents a way of implementing the HEART score into the practice of Emergency Medicine. If the HEART score classifies the patient as low risk (HEART score 0-3) and serial troponin (at 0 and 3 hours) are negative, it recommends early discharge with close outpatient follow-up. Patients with HEART scores of 4-6 merit admission for further observation and testing, and HEART scores >7 support earlier invasive procedures. This seems great, right? This can result in less invasive testing and less healthcare dollars spent. However, each scoring system has its pitfalls. In this post, we will address some questions regarding the HEART score’s safety, effectiveness, cost savings, and utility in the ED. One of the most important factors in building a scoring system is ensuring that, no matter who assigns the score, the results are consistent (inter-rater reliability). There have been multiple studies that have evaluated this, and they have shown that, overall, HEART scores are often equivalent. In a study by Niven et al., investigators found that there was no significant difference in scores when they were calculated in the ED by a senior physician, junior physician, senior nurse, or junior nurse. (8) Because of the high inter-rater reliability, the authors of this study advocated for potential use of the HEART score in the triage in the ED. In contrast, a study by Wu et al. showed that there was a 70% discordance in HEART scores assigned by EPs compared to Cardiologists. (9) However, EPs tended to overestimate the scores, leading to more conservative treatment. Perhaps the biggest limitation of this study was that researchers gathered information from chart review to calculate the HEART scores (the treating physicians did not calculate the scores themselves). So overall, the data is mixed. There may be some discordance, but the available literature indicates that EPs may be more conservative. Q: Does it actually save healthcare dollars? This is perhaps one of the biggest advantages of the HEART score. A study performed in the Netherlands showed that, for the 200,000 patients who present each year with chest pain, approximately 12.5 million euros could be saved per year (assuming 25% have a low risk HEART score). (10) In another study performed in the US, patients randomized to the HEART Pathway group had a cost reduction of $216 per individual. (11) This was driven mostly by fewer cardiac diagnostic tests (12.1% less) and shorter length of stay (12 hours less). Although $216 per patient doesn’t seem like a large amount of money, it has the potential to save $2 billion annually for the 8-10 million patients who are evaluated yearly in the US for chest pain! (11) In addition to the monetary costs of these diagnostic workups, there is also the risk for iatrogenic complications, false positives or negatives, and added patient stress. While we often forget about these costs, they are very important and do have a large effect on our patients. Q: What are the major limitations of the HEART score? 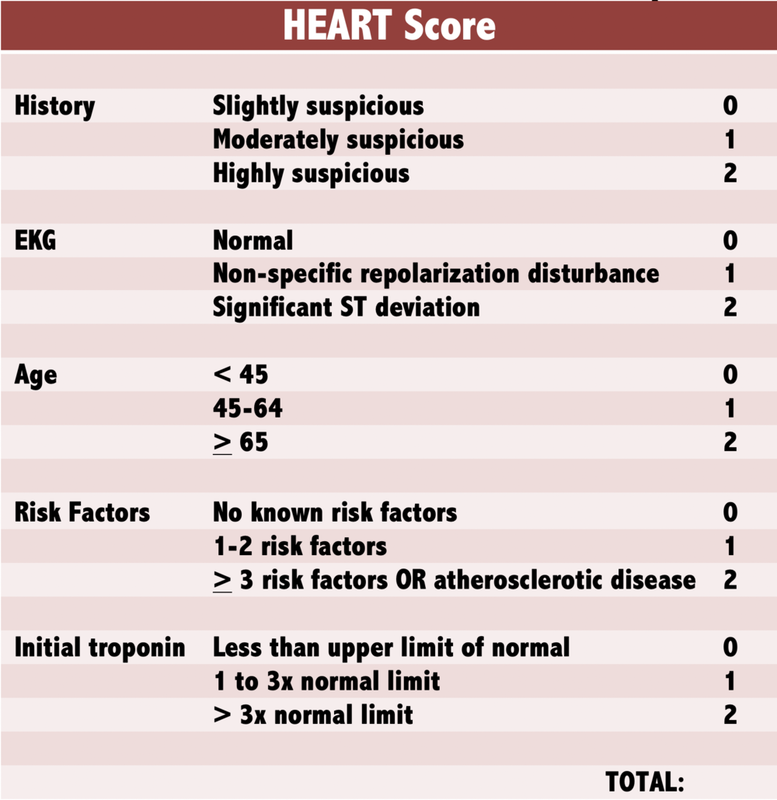 For many EPs, the HEART score has proven to be an easy-to-use and effective decision aid. However, it should be just that – a decision aid. It is important to remember that it was never intended to replace a physician’s clinical judgment. Areas to practice with caution are risk factor calculation, borderline scores, EKG changes, and atypical presentations. Perhaps one of the most common mistakes when using the HEART score is risk factor miscalculation. Regarding diabetes, hypertension, and hypercholesterolemia, the patient must have been diagnosed prior to presentation in the ED to receive points in those categories. However, if the patient lacks access to regular medical care, the physician is able to determine how to appropriately calculate this area of the score. (12) These subtleties of the HEART score can make the difference between scoring a 3 and a 4 (in most interpretations, early discharge versus admission). Think carefully about borderline scores. Although the guidelines say a score of 3 is appropriate for early discharge, not all patients who score a 3 should be treated exactly the same. An important component that the HEART score does not take into consideration is access to follow-up care. With patients that we discharge early, it is important to ensure that they have access to close follow-up. Another area to use caution is with EKG changes. Theoretically, a patient can receive a score of only 1, but still have EKG findings that are abnormal. In these cases, especially if the EKG findings are new or anatomically localized, the patient should be considered for observation or admission for further workup. While the HEART pathway recommends two troponins, it only requires one EKG and the initial score only needs one troponin, and some providers would argue any positive troponin warrants evaluation. In these settings especially, do not forget the importance of repeat EKGs, especially in patients who are still complaining of chest pain, to assess for dynamic changes requiring early intervention. Goodacre S, Cross E, Arnold J, et al. The health care burden of acute chest pain. Heart 2005;91:229–30. Hollander JE. Risk stratification of emergency department patients with chest pain: the need for standardized reporting guidelines. Ann Emerg Med 2004;43:68–70. Anderson JL, Adams CD, Antman EM, et al. ACC/AHA 2007 Guidelines for the Management of Patients With Unstable Angina/Non-ST-Elevation Myocardial Infarction--Executive Summary: A Report of the American College of Cardiology/American Heart Association Task Force on Practice Guidelines (Writing Committee to Revise the 2002 Guidelines for the Management of Patients With Unstable Angina/Non-ST-Elevation Myocardial Infarction) Developed in Collaboration with the American College of Emergency Physicians, the Society for Cardiovascular Angiography and Interventions, and the Society of Thoracic Surgeons Endorsed by the American Association of Cardiovascular and Pulmonary Rehabilitation and the Society for Academic Emergency Medicine. Journal of the American College of Cardiology. 2007;50:652. Owens PL, Barrett ML, Gibson TB, Andrews RM, Weinick RM, Mutter RL. Emergency department care in the United States: a profile of national data sources. Ann Emerg Med. 2010;56:150–165. doi: 10.1016/j. annemergmed.2009.11.022. Backus BE, Six AJ, Kelder JC, et al. Chest pain in the emergency room: a multicenter validation of the HEART Score. Critical pathways in cardiology. 2010;9:164-169. Stopyra JP, Riley RF, Hiestand BC, et al. The HEART Pathway Randomized Controlled Trial One-year Outcomes. 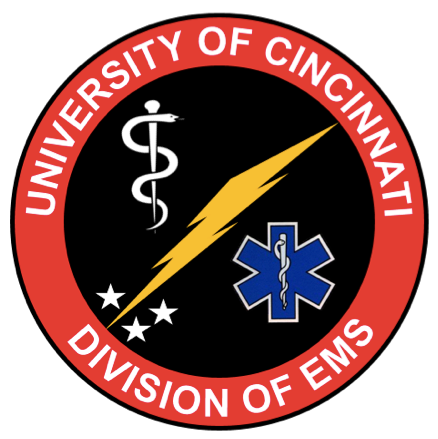 Academic emergency medicine : official journal of the Society for Academic Emergency Medicine. 2018. Mahler SA, Riley RF, Hiestand BC, et al. The HEART Pathway randomized trial: identifying emergency department patients with acute chest pain for early discharge. Circ Cardiovasc Qual Outcomes. 2015;8(2):195-203. Wu WK, BSc, Yiadom, Maame Yaa A.B., MD, MPH, Collins, Sean P., MD, MSc, Self, Wesley H., MD, MPH, Monahan K, MD. Documentation of HEART score discordance between emergency physician and cardiologist evaluations of ED patients with chest pain. American Journal of Emergency Medicine. 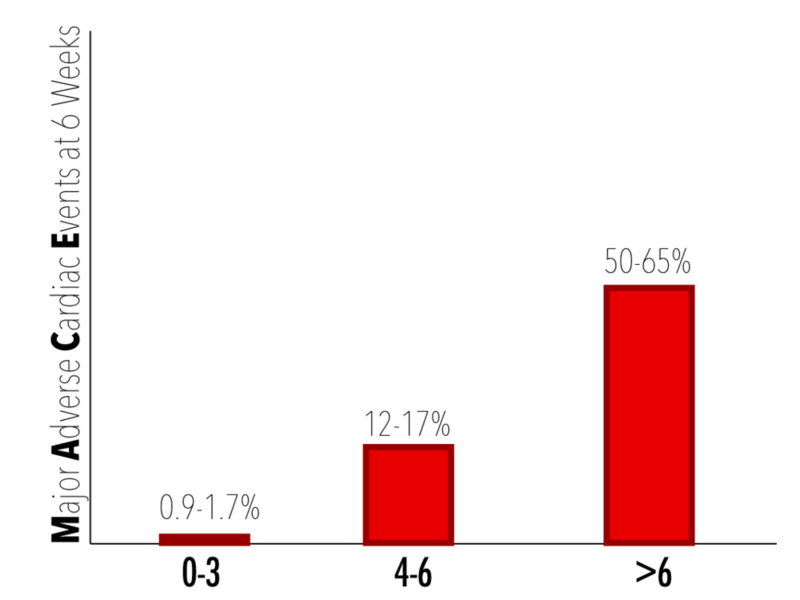 2016;2017;35:132-135. Nieuwets A, Poldervaart JM, Reitsma JB, et al. Medical consumption compared for TIMI and HEART score in chest pain patients at the emergency department: a retrospective cost analysis. BMJ Open. 2016;6:e010694. doi:10.1136/bmjopen-2015- 010694. Riley RF, Miller CD, Russell GB, et al. Cost analysis of the History, ECG, Age, Risk factors, and initial Troponin (HEART) Pathway randomized control trial. American Journal of Emergency Medicine. 2017;35:77-81. Brady W, de Souza K. The HEART score: A guide to its application in the emergency department. Turk J Emerg Med. 2018;18(2):47-51. Published 2018 Jun 14. doi:10.1016/j.tjem.2018.04.004. Backus BE, Six AJ, Kelder JC, et al. A prospective validation of the HEART score for chest pain patients at the emergency department. Int J Cardiol. 2013;168(3):2153-8.